It’s a line I found myself uttering, sometimes in my head and sometimes out loud, throughout tonight’s Raw. We can talk all we want about the three hours the show has to fill, the smaller roster size post-brand split, and any other number of excuses until we’re blue in the face like Braun Strowman trying to catch up to Sin Cara. Those are legitimate factors that must be considered when examining the current dire state of Raw, but at some point the focus needs to shift away from that narrative. Raw is stuck with those three hours, so there’s an urgent need to adapt. It’s not enough to just accept that the show will largely be spotty. Raw needs to be better, and that starts with looking at what it has and finding a fresh way to go about booking the program. The reason I mention the booking of the show is because it’s the easiest way for Raw to fix itself, and right now it’s failing to do anything about it. Ever since the brand split, Smackdown! Live has tinkered with its production, match types, and storylines in order to continually keep things interesting. The Blue show isn’t succeeding only because it started with a relatively blank slate or because it only has two hours to fill. It’s succeeding because it’s making everything matter, from squash matches to midcard feuds, and more. Hell, it’s turned a goddamn WWE Network-specific talk show into must-see TV! And here’s Raw, boasting three hours of time, a great roster of main event stars in both the Women’s and Men’s divisions, and the unique draw of the Cruiserweight Division, and it can’t even put together a competent segment, never mind string weeks of compelling shows together that could reasonably pay off well at a PPV. Fixing Raw, or rather beginning to shape Raw into something that tells a coherent, compelling story, begins with following through on your biggest assets. The best moment of the new post-brand split Raw is Kevin Owens winning the Universal Championship, but it’s not because it’s a title win, but rather because it’s Raw putting their weight behind the guy who’s the best at this whole professional wrestling thing. It signalled to the audience that this was the new normal, that this kind of excitement, unpredictability, and change would be considered standard going forward. Or, at least that’s what it should have signalled. So, here we are, with Raw spending weeks boasting about how the Cruiserweight Division is going to light the world on fire, and what do we get? Delay after delay after delay. The Cruiserweights don’t show up until the third hour. I can’t imagine a more boneheaded move. Why not start the show with the Fatal Fourway to determine the #1 Contender for the Cruiserweight Championship? Why not start out with a bang? If the story you’re trying to tell is that these Cruiserweights are going to make an immediate impact, and that they’ll be the defining section of Raw that makes Smackdown! Live wish that had thought of such a thing, then you have to lead with it. Trust them to go out there and put on one hell of a show—surprise, they totally did!—and hook your audience. Otherwise, you’re suggesting that you don’t have much faith in them. So, instead of starting out hot, the Cruiserweights are burdened with resuscitating the lifeless, bloated corpse of Raw while Mick Foley, Roman Reigns, Stephanie McMahon, and Kevin Owens kick off the show in predictable fashion. 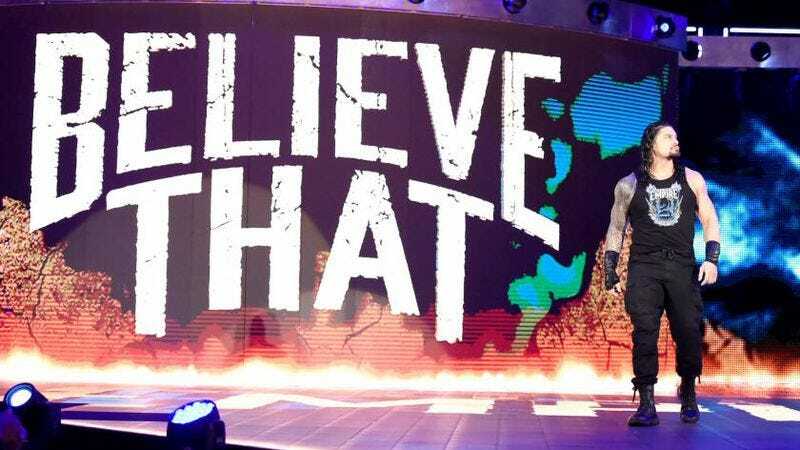 There’s something halfway compelling in the continuing story of Rollins, Owens, McMahon, Foley, and the absent Triple H, with a complex series of uncertain motivations and potential secrets. But the intrigue can’t make up for what’s still a paint-by-numbers, and rather illogical Authority storyline. Sure, Foley is the babyface GM, but the narrative beats are still in line with what Steph and Triple H would do when they were the evil powers in control of Raw. So, rather than just punish Seth Rollins and Rusev—fighting in a match is a punishment, by the way—Foley decides to course correct for his mishandling of the show last week by giving Roman Reigns a rematch against Kevin Owens, but this time inside a steel cage. When Owens comes out and incredulously asks if Foley is serious, he’s speaking for all of us. How is this a “correction” for last week? Don’t get me wrong, having the GM throw some gimmick matches into a random episode of Raw is a great idea, and perfectly plays into the idea that Smackdown! Live and Raw are competing for ratings, but there needs to be a good reason. Tagging something as a “main event” isn’t enough. A main event should be more than the last match on the show; it should mean something. No amount of Rollins jumping off the top of a cage changes the fact that nothing matters here. My notes are filled with scribblings that amount to “who cares?” repeated over and over again. There are no stakes in the matches tonight, outside of the incredible Cruiserweight match. I’d say this is just a case of Raw phoning in a go-home show if this pattern of stakes-less booking wasn’t the standard at this point. I mean, Cesaro and Sheamus are putting on stellar matches week after week, and it’s all for nothing but some vague sense of being better at their job than the other person; Sasha Banks and Bayley are tag partners and I can’t even get excited about the match; Enzo and Cass get to verbally spar with Chris Jericho and New Day, and yet it’s all in service of a throwaway 10-man tag match. Where’s the urgency and sense of importance? Where’s the New Era we were promised? Oh yeah, it’s over on Smackdown! Live. Results: Seth Rollins vs. Rusev ended in a double countout; Braun Strowman defeated Sin Cara; Charlotte and Dana Brooke defeated Bayley and Sasha Banks; Bo Dallas defeated Gary Graham; Cesaro defeated Sheamus; Sami Zayn, Enzo and Cass, and the New Day defeated Gallows and Anderson, The Shining Stars, and Chris Jericho; Brian Kendrick defeated Cedric Alexander, Rich Swann, and Gran Metalik (match to determine the #1 Contender for the Cruiserweight Championship); Roman Reigns defeated Kevin Owens (Steel Cage match). So Roman Reigns, barely a legit contender for the United States Championship, gets to kick out of the champ’s finisher and win the steel cage match? Go home, Raw. You’re drunk. Chris Jericho is delightful. I don’t think anything else needs to be said. Why don’t Bayley’s inflatable tube men pop up on the music beat change anymore? It’s blasphemy. I will never not cry during an Eddie Guerrero tribute. Seth’s Falcon Arrow to Rusev was beautiful. Also: his energy in that match. Ai am thoroughly enjoying watching him slowly shift his in-ring style to match his new babyface role. Bo Dallas is definitely jacking the Bray Wyatt cadence with his poetry. Jericho really does love his lists.